Would you buy a used car from David Bonderman (lead image), Dmitry Shvets, and Jan Dunning if you knew they registered their businesses in the British Virgin Islands (BVI), Cayman Islands, and Bahamas; kept their takings out of their companies and in their pockets; and were more heavily indebted to the state than any of their competitors? 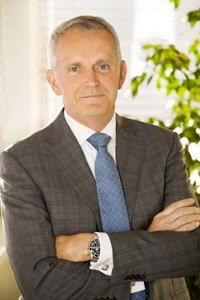 Bonderman is one of the principals of the TPG Group, an equity investment fund in San Francisco; Shvets works for him as the head of TPG’s Moscow office; and Dunning, a Dutchman, is chief executive of Lenta, a Russian supermarket and hypermarket operator. Together, they are trying to sell their shares on Lenta’s second attempt at an initial public offering (IPO) on the London Stock Exchange (LSE). The story of the failure of their first attempt can be read here. This time, they are more confident of selling about one in five of Lenta’s shares and pocketing about $1 billion for themselves. Unlike most Russian IPOs in the international market, not a penny of this share sale will be invested in the future of Lenta’s business. That is financed almost entirely by debt – by the operating tactic of paying unusually slowly for incoming goods; and by borrowing heavily from Russia’s state banks, to whom almost all of Lenta’s assets are pledged. The risk of Lenta’s future is thus to be carried by store suppliers, banks, and new shareholders who haven’t been let in on the selling shareholders’ most sensitive secrets. One of those secrets is why the exiting shareholders think they can get away with their scheme when they are in clear violation of President Vladimir Putin’s announced ban on all state bank lending and support for offshore operators. Lenta and its underwriters – Credit Suisse, JP Morgan, Deutsche Bank, UBS, and VTB — have issued a prospectus of 372 pages. That was on February 13. The offer document left several important pieces of information undisclosed, notably the number of shares the insiders are selling; and the planned distribution of shareholdings after the IPO is completed. 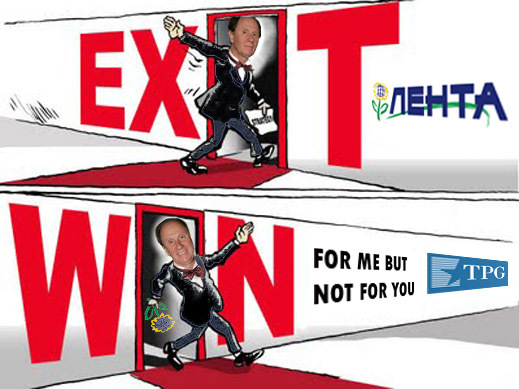 Spokesmen for Bonderman and Shvets (right), as well as for VTB and for another control shareholder, the European Bank for Reconstruction and Development (EBRD), refuse to release the prospectus for analysis, and refuse to give a reason, except to refer to the small print on the first prospectus page. There it says that circulation of the prospectus is restricted to QIBs – that’s “qualified institutional buyers”. Since the selling units are called Luna Inc. and Luna Holdings Inc., both Cayman Island fronts, lunatic is one word for a buyer who is qualified to buy from them. On the way to the LSE, the prospectus fell off a Deutsche Bank truck. Judge for yourself if you are qualified to understand it. The share capital of Lenta reportedly comprises just over 86 million shares, each represented by five global depositary receipts (GDRs), making a total of almost 435 million GDRs. The London sale now under way will dispose of 19.1 million shares (109.5 million GDRs), or 22%. The prospectus acknowledges that another 64.2 million shares (320.7 million GDRs) will be sold “from time to time…(to the extent permitted by law).” The share sale will continue on the Moscow Stock Exchange (Micex). The prospectus has put a price tag on the Lenta paper for sale between $9.50 and $11.50 per GDR. That adds up to a valuation of Lenta as whole of between $4.1 billion and $4.9 billion. According to a report from Uralsib Bank analyst Marat Ibragimov, this represents a hefty discount from valuations by the underwriting banks and the selling shareholders: they claim Lenta is worth between $5.1 billion and $7.5 billion. At the offer price, according to the prospectus, Lenta shares are at a discount of between 25% and 31% from Magnit, the largest grocery retailer in the Russian market. They are at a substantial premium to other Russian retailers whose shares are also listed on the stock market. 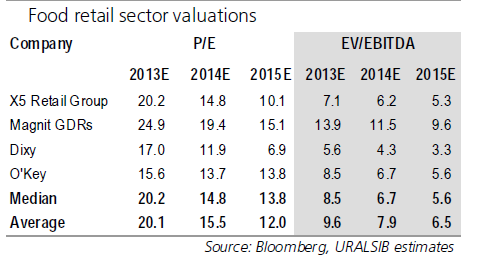 Here is the Uralsib Bank tabulation of those Russian rivals on two standard measures – the ratio of share price to earnings (P/E), and the ratio of enterprise value to earnings (EV/Ebitda), applying 2013 figures and estimates for 2014. Employing several asset, share price, and business model methods, Uralsib Bank thinks fair value of Lenta is between $4.9 billion and $5.4 billion. The P/E for Lenta in the share price offer range would be 18.3 and 22.2 (2013 data); 15.1 and 18.3 (2014 estimate). The EV/Ebitda ratio for Lenta for 2013, as calculated by Ibragimov, is between 10.4 and 12.1; for 2014, the ratios would be between 8.4 and 9.8. In short, sharebuyers are being advised to think of Lenta as a worse risk than Magnit, but a better risk than X-5, Dixy and O’Key. The reasons given for this by most institutional advisors is that Lenta is growing faster than its domestic competitors, with higher earnings margins. Because the Russian grocery market is the second largest in Europe after France, with annual turnover of about $350 billion; and because it is one of the fastest growing food retail markets in the world — 11.7% per annum in roubles, 9.1% in dollars – buying Lenta shares now looks like a sure bet on the continuing growth of the Russian market, sustained by continuing increases in consumer incomes and demand. 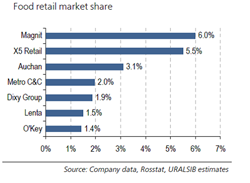 For the time being too, the big Russian retailers have yet to drive the smaller ones out of business, so that their share of the all-Russia market is only 18%. The top-5 retailers in Germany control 69% of that market; in the UK, 63%; in France, 60%; in Poland, 42%. Russia is bound to be heading in the same direction, the market believes, so in catching up, Lenta should continue growing at double-digit rates, sustaining predictable profits, rich dividends, and stable capital gains as share prices push upwards on demand from fresh sharebuyers to pay premiums to get in on the richesse. For timing, this assumption – drafted during last July’s abortive IPO attempt — may be too late. The deterioration of the Russian economy accelerated in the second half of 2013. Last month capital investment in the economy shrank by 7%, compared to January 2013; industrial production contracted by 0.2%; and real disposable income fell by 1.5%. A combination of domestic Russian and global emerging market factors has been pushing downwards on Magnit’s share price, which has fallen 19% so far this year. Dixy has dropped 26%; O’Key, down 12%. Only X-5 stands out with a modest gain of 7.2%. Source: Uralsib Bank (click to enlarge). In order to expand, as Lenta describes its growth strategy, it must count on money from operating cashflow and increasing debt. Even if profitability continues as forecast, both requirements risk shorter dividend payouts for new shareholders, while the control shareholders continue selling out, passing on future risk and exporting capital to their offshore hideouts. If the prospectus and the company’s promotional releases are right, and Lenta’s future growth is a better bet than its risk profile, why are the control shareholders all selling more shares than they want to acknowledge publicly – and why aren’t they re-investing in Lenta any of the IPO proceeds in the success story they are pitching to others? 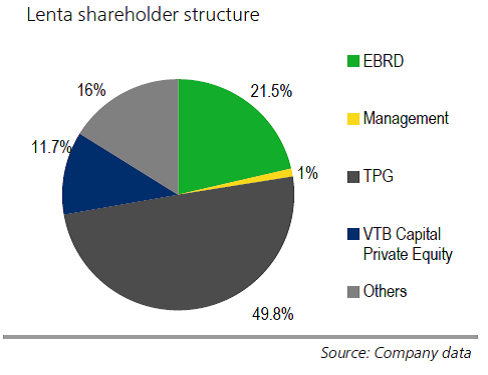 TPG is the dominant shareholder of Lenta, with 49.8% of the shares before the IPO. 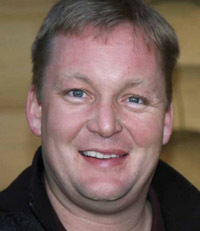 It holds those shares, according to the prospectus, through Luna Inc. of Cayman Islands. VTB holds its 11.7% through Luna Holdings Inc., also of Cayman. Why the state bank should keep its shares offshore, and why it and TPG share the Luna name may reflect the history of shareholder conflict at Lenta in the recent past, and the selloff of the founding shareholders. More of that history can be followed foggily in the prospectus, and here. The prospectus also reveals that another 6% of the shares are being sold by entities in the Cayman Islands, BVI, and Bahamas; they are called Periwinkle (Cyprus), Bowdon (BVI), MEM (Bahamas), and Steep Rock (Cayman). Dunning, who appears to be a selling shareholder himself, was asked to identify the beneficial shareholders behind these front-company names. He refuses. Three individuals are selling out – Loren Bough (5.2%), Edward Nicholson (2.4%), and Alexander Easton (2.4%). Bough (right) lives at a Montana address. 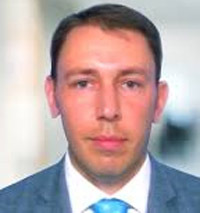 A share trader in the Russian market since the mid-1990s, he has been a board director of Lenta, but he now appears to jumping ship, along with Nicholson and Easton. The latter two don’t give anything away about themselves except that they are selling their Lenta stock through a Luxembourg front called Cebalrai Holdings. The name appears to have been borrowed from a video-game creature which releases a bio-electric field to stun its prey. Shareholders buying from Cebalrai should beware of being stunned. Before the beast took over their interests, Bough, Nicholson and Easton were involved in the shareholder fighting at Lenta, but this isn’t reported in the prospectus. Their modus operandi is better explained in this judgement of the Easter Caribbean Supreme Court. It isn’t every day that investors are invited to trust a corporate governance report like this. But the EBRD, a taxpayer-funded institution of sorts with a governance code of its own, was asked to clarify how many shares it is selling. The EBRD spokesman refused, adding “I don’t know what the post-IPO share of the EBRD will be, but would not be able to tell you if I did as this kind of information could affect pricing.” That’s an acknowledgement from the EBRD that if the market knew by how much the institutional shareholders are selling out, the Lenta share price would almost certainly be much lower. Except for the EBRD, noone has admitted the obvious. The EBRD spokesman also said: “A prospectus certainly has to be published and will of course give all necessary information.” He didn’t say that by “published”, the EBRD didn’t mean publication. In his speech to the Federal Assembly on December 12 last, Putin announced that “companies that are registered in a foreign jurisdiction will not be allowed to make use of government support measures, including Vnesheconombank credits and state guarantees. These companies should also lose the right to fulfil government contracts and contracts for agencies with government participation. In other words, if you want to take advantage of the benefits and support provided by the state and make a profit working in Russia, you must register in the Russian Federation’s jurisdiction.” For a report on what happens next, read this. Lenta appears to be in clear violation because it is a BVI company with an exclusively Russian income stream, and because it is almost totally dependent on state bank credits from VTB and Sberbank. According to the financial presentation in the Lenta prospectus, Lenta’s total borrowings at the end of 2013 came to Rb46.04 billion ($1.3 billion), double the indebtedness of two years earlier. Two-thirds of this aggregate (Rb30.375 billion) had been loaned by VTB, with Rb10 billion available to be drawn from VTB when Lenta asks. Another Rb4.95 billion borrowed in 2011 from TransCreditBank was reassigned to the Bank of Moscow in March 2013; by that time VTB owned both TransCreditBank and the Bank of Moscow. Another Rb4.5 billion is owed by Lenta to state-owned Sberbank. Altogether, 87% of Lenta’s indebtedness is owed to the state banks Putin identified as soon to be prohibited from lending to offshore operators.